"Lisa's got school, career, posture . . . why'd she have to steal Krusty from me?" "All About Lisa" is the twentieth episode and season finale of season 19. It aired on May 18, 2008. The episode guest stars Drew Carey as himself. "Lisa becomes Krusty the Clown's newest assistant and steals his spotlight. She wins the Entertainer of the Year award, but is warned that with her sudden fame comes a new attitude towards others and herself. Meanwhile, Homer and Bart bond over their newfound love of coin collecting." At the 38th Annual Springfield Entertainer of the Year Awards, Lisa wins the entertainer of the year award (which won the 2007 Awardie Awards). 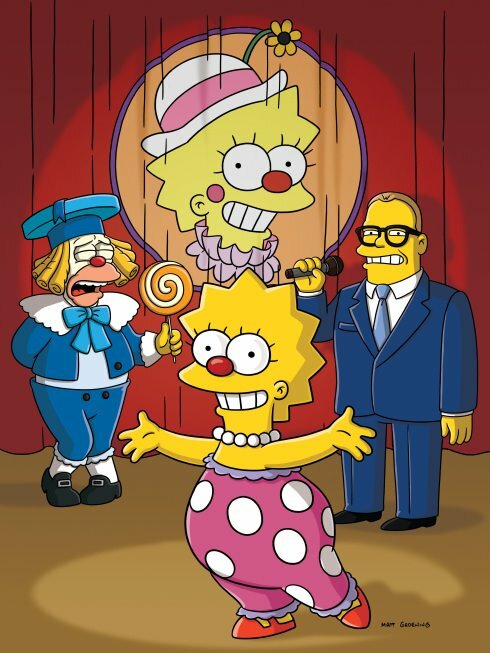 Later Sideshow Mel flashes back to Krusty's 4000th Episode to show how Lisa became an entertainer. Later Krusty shows a flashback clip of an earlier show with a group of singers called the Krustkateers (parodies of the Mousketeers) and is searching for new Krustkateers. At the tryouts Bart competes against Sherri and Terri, Milhouse, Ralph and Nelson but Bart unfairly loses to Nelson after Krusty was bribed by Nelson's Mother (though Krusty mistakingly calls Nelson "Wilber Mud") Lisa then begins to tell Krusty that he was wrong to put Nelson on the show and suggests that he hires Bart as his intern however Lisa's plan backfires and Krusty hires her instead as his Intern, Nelson is later fired and then Krusty puts on a show but after Mr. Teeny can't make it to one of the shows Lisa takes the opportunity to fill in for him and eventually becomes so successful she runs Krusty's show off the air and begins her own television show named "The Lisa Show" and soon Lisa is nominated for the annual entertainer of the year award. Meanwhile Bart is upset that he was not chosen for the job of working alongside Krusty so Homer decides to sell all of Bart's Krusty products to the Comic Book Guy so Bart can buy the new Radioactive Man comic issue of Radioactive Man vs. Muhammad Ali with the money but instead he is offered a copy of Radioactive Man Meets the Kansas City Royals so Bart changes his mind towards a copy of Radioactive Man vs. the Restless Leg Syndrome but then he is offered a coin collecting book. Bart and Homer start coin collecting and after finding what they thought to be every coin in the book they find an extra slot for the "Kissing Lincolns Coin". Homer and Bart then find try finding it in a penny pile but instead but instead after no luck go to an auction where the coin is being auctioned but they lose to Mr. Burns who wins the coin with a final bid of ten million dollars. Homer then manages to trick his boss into giving him four cents for a gumball, unknowingly handing over the Kissing Lincolns Coin in the process. Later the flashback catches up to the present time where The Simpsons are at the 38th Annual Springfield Entertainer of the year awards where Lisa is handed the award, later in her personal changing room Sideshow Mel brings Lisa into the hall of fame where most of the stars pictured in the hall have lost their fame due to their busy lives. It is revealed there that Sideshow Mel is one is in fact of them and Lisa soon finds out the that the same fate could happen to Krusty too so she indirectly gives all her fame to him and then goes home shortly after returning everything to normal. At the time, this episode had the second lowest ratings in Simpsons history, with just 6.11 million viewers. Modified on June 20, 2018, at 13:24.